The weekend before Christmas I had to make a last minute business trip to Toronto. Since Honey was already on her holiday break and didn’t have any major plans we decided to combine business with pleasure and make the trip together. Though a little rainy, the weather was very mild for late December so most of our free time together away from my meetings was spent exploring downtown and Old Town Toronto on foot; something I had never done despite at least a dozen previous trips there over the years. Ahh, the things we take for granted…or perhaps I should say: the things we don’t even realize we’re missing until we get out of the darn car and explore a little on foot. 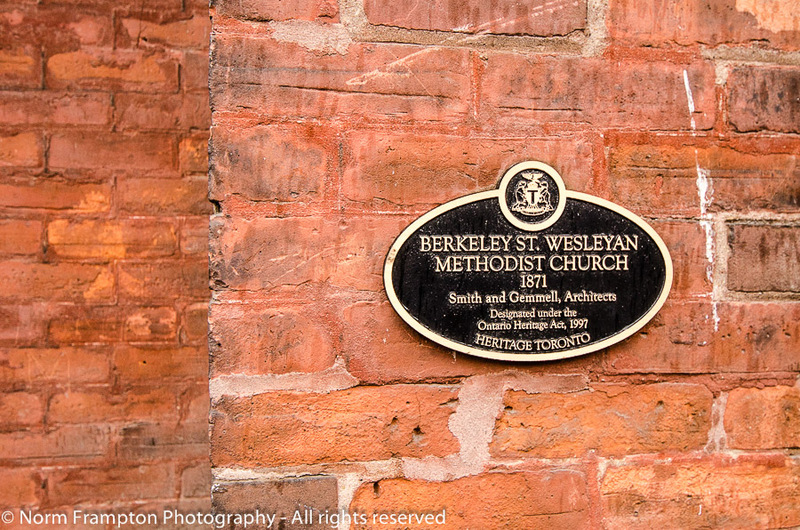 Located on Queen Street East in one of the oldest parts of the city, Berkeley Church was built in 1871 and has been a designated Ontario Heritage site since 1997 to protect it from future redevelopment or demolition. Though no longer used as a church, today the building is probably seeing more activity than ever. Now an event venue that’s available for rent for a variety of functions, it hosts up to 150 corporate and private events per year, according to their website. 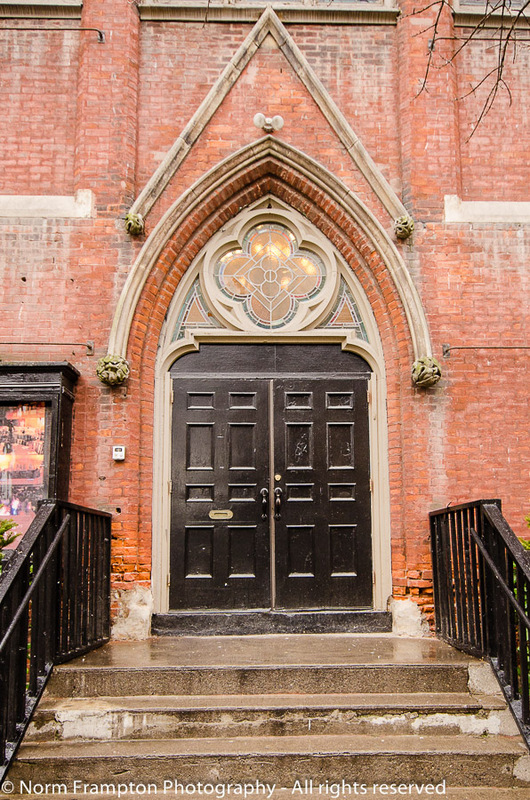 Gallery | This entry was posted in Photography, Thursday Doors and tagged Church, Doors, Historic Architecture, Old Buildings, Old Town, Photography, Thursday Doors, Toronto, Walking Tours. Bookmark the permalink. As always – beautiful doors! What a great find Norm! Particularly love the blue door to the basement, a real stunner, looks almost oriental in design, wonder if that’s possible? What a great find. Serendipity!!! And you’re right — getting out on foot (or on a bicycle) makes a world of difference. Some really nice shots. Hard to beat the mellow warmth of old brick! I love the faded blue door best. It has a lot of character. These are great…as always! Thanks to Dan for the explanation of the stained glass design…I also like the mossy green in this one. My favorite is probably the same as yours…the side doors. The faded blue, weathered paint speaks to the many stories this church must hold behind those doors…and just look how kind some graffiti artist was to try to match the color! Thanks. That mossy green really stood out in the wet conditions. Such beautiful doors. And so interesting. I’m glad I found your post through Cee. 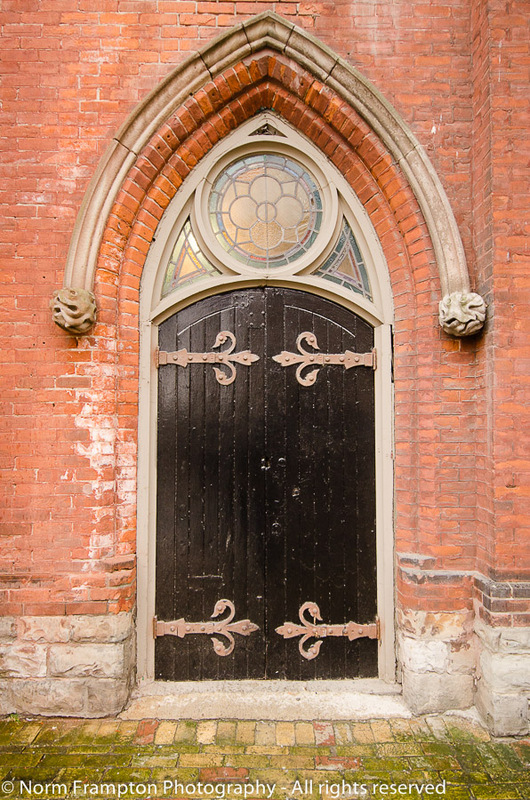 The rosette window in the top of the first door belongs to my favorite ones. But, the second door is so cute. Thanks for sharing and hosting! Thanks. Those rosettes still have me befuddled. I’m trying to figure out what they are supposed to be – each one is different. I’ll go back to the original file to zoom in and see if I can figure out what they are. Hi Norm, I was going to play with your challenge this week. I didn’t think of the porta-potty doors until you mentioned it though. Here is my entry for this week. Hello and welcome Laura. I can leave your link here if you like but I’m afraid it will get lost among the comments on my doors post from last week. I suggest you drop in on Thursday (tomorrow) and add it to the list in the new post for this week. The Methodist Church I went to didn’t have any where near such ornate doors! 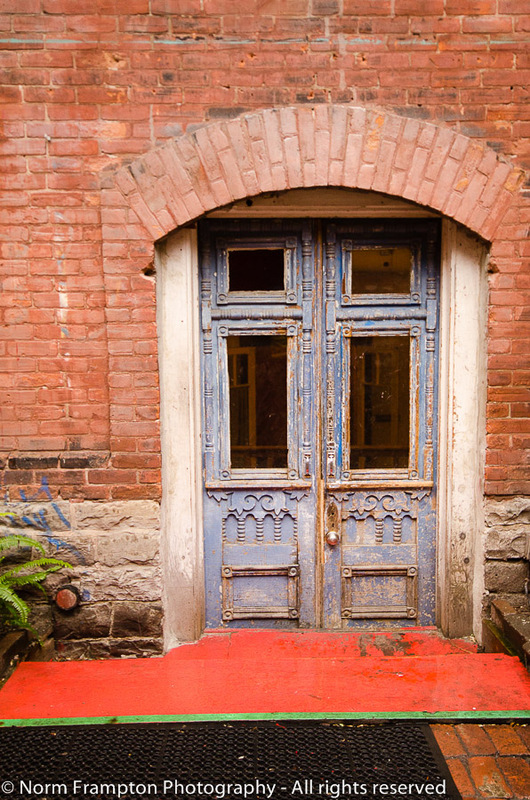 Love the courtyard door, the worn paint only enhances their beauty! Love the basement door! The textures and patterns are fantastic – and the aging of the paint only adds to it~ lovely! I especially like the last two photos, the second last one’s arch above the door, along with its decorative hinges is a work of beauty, and the old weather-worn door is one of character. Gorgeous! Your favorite is my favorite too! I really like the glass windows on top of the doors. A great find while on your walk! Thanks so much. The glass is lovely isn’t it? Lovely. We lived in Toronto for 25 years and I walked by that church many times and always liked it. I am assuming you also made into the Distillery District which has lots of interesting architecture. Thank you. The Distillery District is right nearby but the rain was picking up so we didn’t get to explore that area as much as we wanted. Next time though, for sure. I haven’t been to Toronto for years, unfortunately, but you brought a bit of the beauty of it alive for me. Thanks. Something about doors of old churches is so welcoming. I love the huge hinges. I’m happy to see these old buildings being preserved. Toronto has had a bad reputation in the past for simply steamrolling over old buildings in favour of the newest high rise. Not to criticize but yes, we noticed that. Our expectation for Old Town was that it would be a bit like Old Montreal; it’s an entire section of town where almost everything is old, but we found that the well-preserved old buildings were too few and far between. But there were some very nice ones like this, and I’ve got a few more posts coming that show off some of the others as well. It was a fruitfull couple of days. Absolutely. I wanted to but it was a last minute trip, literally the weekend before Christmas. Next time with a little advance notice we’ll get together for sure. Excellent! … and the same if I ever find myself in Montreal. Thanks Judy. The amazing thing with places like this is the longer you look the more fine details you notice. Everything is there for a reason isn’t it? Beautiful doors Norm and very familiar windows. The Methodist church I grew up in had a window like the one at the top. I think it represents Jesus (center) and the the four evangelists. I’m glad to see the building survive and for its architectural details be preserved. I think the side door might be my favorite too. Thanks for the explanation Dan. I’m going to start doing a little more digging to find out more about the symbolic/religious significance of the features on all these churches I’ve been photographing. What a gorgeous church! Every door is beautiful and your photography captures them so well. That last door is unique for a church. It’s fantastic! Nice that you had the chance to explore while away on business. I’m lucky; my work generally allows me to sleep in my own bed most of the time, but when I do have to travel for business, I try to make use of my downtime to explore a little. The side courtyard door is just lovely. It reminds me of old, well-worn denim.